Instron's 5940 Single Column Tabletop Testing Systems are universal, static testing systems that perform compression and tensile testing; and also perform shear, peel, tear, flexure, cyclic, and bend tests. The 5900 Series is designed for precision, made for durability, and offers the flexibility for shifting requirements. The 5900 Series is designed with optional and standard features that increase testing efficiency and improve the testing experience for the operator. Single column frames are normally used for medical devices and biomaterials, textiles, food, elastomers, small components and microelectronics, paper, wire and plastic film. Two key advantages of 5940 single column systems are their small footprint and frame stiffness. The small footprint of the 5942, 5943, and 5944 saves valuable laboratory space, which is important to keep in mind when purchasing a testing instrument. The superior alignment and stiffness of the 5900 load frames ensure precise alignment when testing everything from biomaterials to wire or plastic film. The rigid mechanical design ensures the best possible conditions for repeatable test conditions and dependable results. 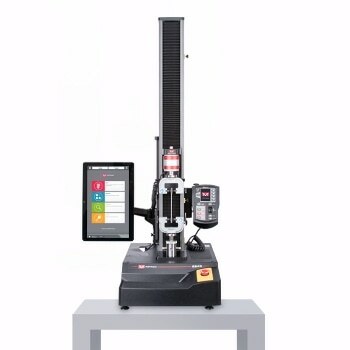 * Total vertical test space is the distance from the top surface of the base platen to the bottom surface of the moving crosshead, excluding load cell, grips, and fixtures.